This position was eliminated from last year’s budget as a result of the approval of the alternate budget proposal at the FTR. This statement spins so much and leaves out so much that anybody who watched the budget process and its aftermath, last year, would have to call it untrue. As reported in this space, in May, the much bigger challenge for the school department’s budget after the financial town referendum (FTR) was inaccurate estimating. The 0.9% Budget #2 reduced the school department’s requested increase by $126,341, but the superintendent then announced that the department’s request had actually been off by $423,244 already. 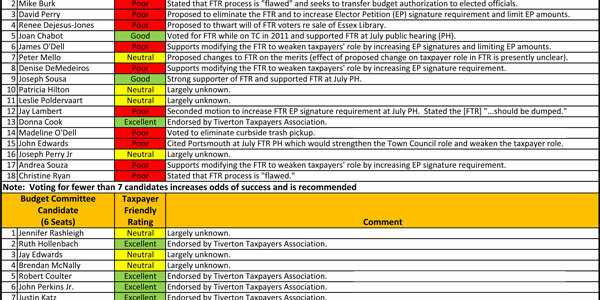 That larger number (which is about 1% of the total request) would have been the same whichever budget had won the FTR. All throughout the budget process and the month or so until the school committee finally reversed its quick decision to eliminate full-day kindergarten, there was a clear connection between the budget vote and kindergarten. The increase for which the schools asked was the increase for kindergarten, and that was the money declined in Budget #2. Had Budget #1 won the FTR, it is almost inconceivable that the school department would have cancelled the kindergarten plans in favor of the other reductions that officials had to make due to the estimating errors. Sure, had the department’s original request been granted, it might still have saved the money in transportation in order to fund additional programs, but that possibility was never so much as aired. The story was that (under pressure from parents and taxpayers) the district’s administration undertook heroic efforts to negotiate with the bus contractor specifically in order to find the money for full-day kindergarten. And let’s not forget that this entire debate and process occurred while the district was still technically in negotiation with the labor unions, to which it proceeded to concede raises. Reviewing video of the relevant school committee meetings is a good reminder of how quick elected and appointed officials were to tell everybody that supporters of Budget #2 were ignorant and had deceived the public with falsehoods. Tiverton residents who follow these battles from year to year should consider that those accusations may be nothing more than projection.